Walt Disney once said of his boyhood home in Missouri, "More things of importance happened to me in Marceline than have happened since--or are likely to in the future." Marceline historian Kaye Malins is making sure those important memories are preserved. Kaye is director of the Walt Disney Hometown Museum, a treasure trove of over 3,000 photos and assorted memorabilia that tell Walt's story both as a child and as an adult returning to his beloved Marceline. Most of the items were donated by the family of Ruth Disney Beecher, Walt's younger sister and a friend of Kaye's before Ruth passed away in 1995. The Museum is just one of the many sights to see in this small farm community just a two-hour drive from Kansas City. There is also Walt's Barn, located on the same property young Walt and his family lived on from 1906-1911. The barn is a recreation of the original structure that stood there in Walt's time and identical to the one he built at his Carolwood Estate in Holmby Hills in the 1950s. The barn is open to the public and visitors are encouraged to leave messages to and about Walt on its interior walls (bring a Sharpie). Nearby is the Dreaming Tree, a long-suffering (it's been struck by lightning multiple times over the years) cottonwood tree that Walt himself would daydream under as a child. Appropriately, Kaye and her family live in the home on the property, but it's their private residence and no tours are available. Kaye is my guest today in The Mouse Castle Lounge and she has many fascinating stories to tell about Walt Disney and about Marceline's history. Visitors to that other museum, the Walt Disney Family Museum in San Francisco, can meet Kaye in person on August 23rd, as she co-presents a screening of the historical documentary Marceline by filmmakers Andy and Sara Neitzert. 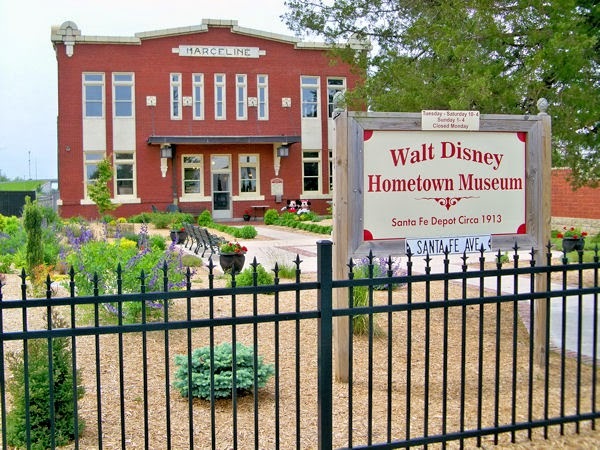 The Walt Disney Hometown Museum in Marceline, MO.